Friends of Unity Blog Hop-April Showers! Happy Saturday! And hello Unity Fans! using that red rubber goodness ! We have a blast! I feel like I kinda "cheated" because I used an Itty Bitty from Unity, called Bundle Congrats! I always use kits, but this time - this little stamp called out to me! It was perfect for a sweet little baby card! You should REALLY check out the Itty Bitty's from Unity - they are SO affordable and when they are on sale they are practically a steal! You can find the one I used HERE. I paper pieced the cloud and colored the wee little hearts with my Zigs. The background panel was created with just a watercolor paper piece and an Aqua Painter using SU's Berry Burst ink. 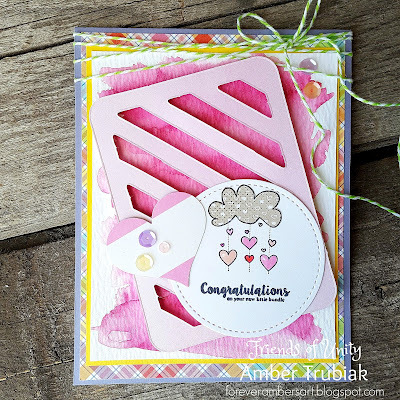 My Lawn Fawn's Rainbow Plaid paper was just the right fit for this card for another layer - and although this card just squeals "GIRL" ... with a few color changes, it could work for a boy too! Next up on our Hop is Crystal - she always inspires me with how creative she is! Go and check out her project and leave some love! 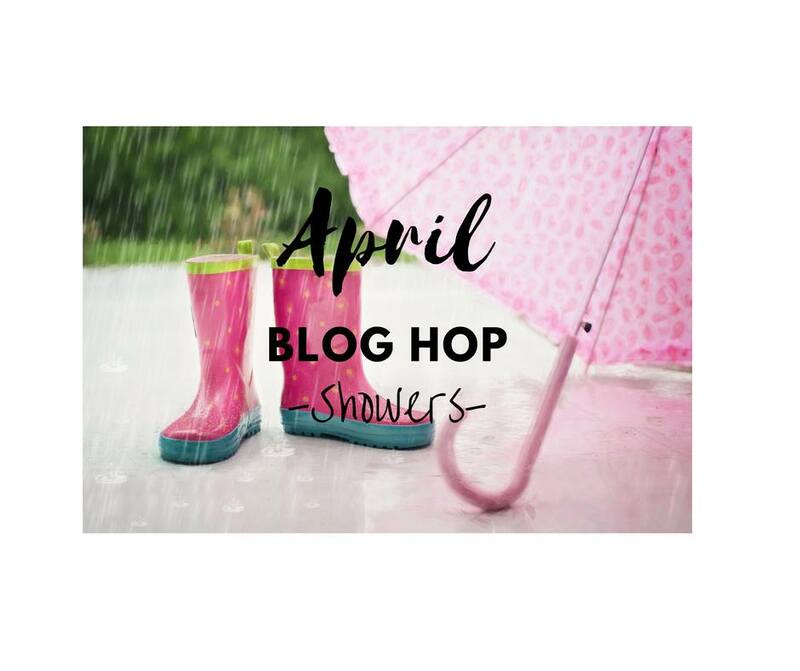 Here is a list of the other Blog Hop participants! Be sure to stop in and visit everyone! This is an adorable card! I love that little stamp and the diagonal paper you used! Such a sweet card! I adore that cloud stamp! Love all the layers, too! I love Itty Bittys...and I just got that plaid paper pack! Great card! Thank you Wilma! I love the plaid paper - you will enjoy it! 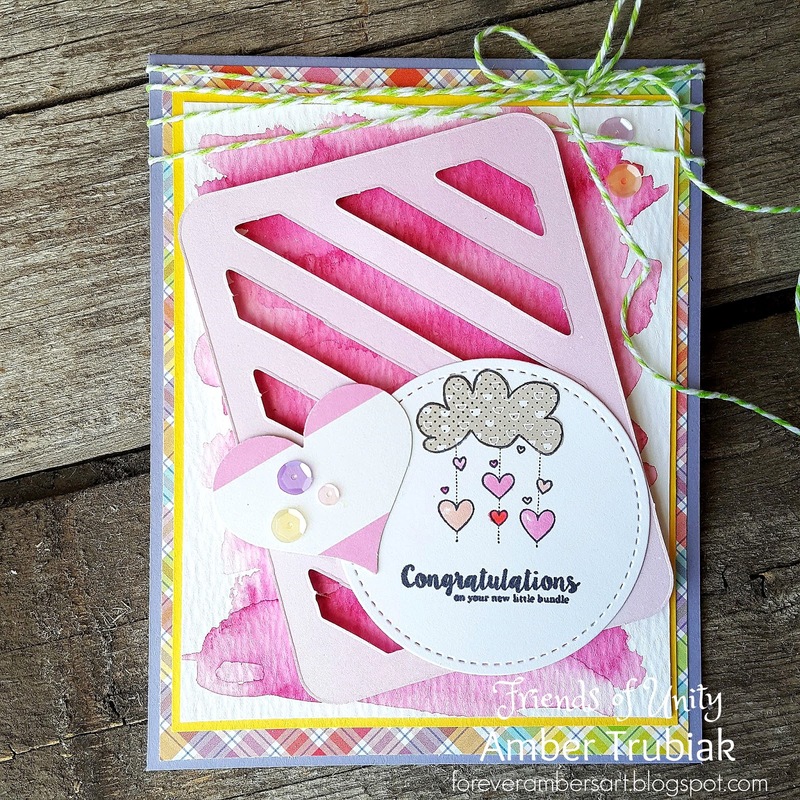 Lovin' this sweet card, with all your layers! I need to check this stamp out for sure!! This is so cute. What a great use of this cloud and rain stamp! Bright, cheerful and super cute! This is so cute!!! I live the layers. Super cute! I love the layers! A perfect baby shower card, it is sooo cute!! I love this! That little cloud is super cute!! I have this itty bitty, but I have never thought of it for a baby card. It's perfect! Super sweet card Amber! I love all the layers! Love all the layers...can’t get enough of them! So cute...keeps reminding I have my first grand baby due in October! Great card to case! Ooooh a new grand baby is exciting!